Pendulum EffectIf an “Odd-Eyes” card(s) you control is destroyed by battle or card effect: You can Special Summon 1 “Odd-Eyes” monster from your hand, Deck, or GY. You can only use this effect of “Odd-Eyes Arc Pendulum Dragon” once per turn. Monster EffectMade from miracles, this valiant and beautiful dragon has gleaming eyes that reflect an arc drawn in the sky. Odd-Eyes Arc Pendulum Dragon is a Level 7 Dark Dragon-type Pendulum Monster with 2700 Atk and 2000 Def and Scales of 8. It only has a Pendulum effect where if an Odd-Eyes card is destroyed you get to Special Summon an Odd-Eyes monster from your Hand, Deck, or Grave. You only get that effect once per turn, and the lack of a monster effect is not too bad. Odd-Eyes and Pendulum in the name make this card very searchable. Also, all the destruction and self destruction effects in the deck make the Pendulum Effect likely to go off every turn. Finally, since this is a protagonist deck, there will likely be more cards to Special Summon in the future. Now the decision becomes which draw cards to run, Allure, Seven Star, Desires, or future Draw 2. Options are great. Here we have the last of the Legendary Dragon Decks to review this week, and this one is my personal favorite, the Odd-Eyes Deck. 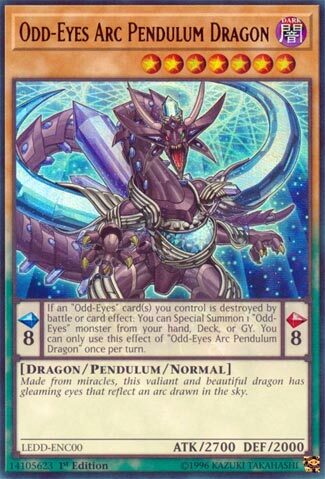 Just like the last two weeks we will start with the new card in the deck, Odd-Eyes Arc Pendulum Dragon. First I would like to mention how searchable this is. You got cards like Spiral Flame Strike, Duelist Allicance, Performapal Skullcrowbat Joker, Sky Iris, and Summoner’s Art. It is very searchable and you might likely be searching for this as soon as possible. Arc Pendulum is an 8 scale with only a Pendulum Effect. If an Odd-Eyes card you control is destroyed, you can summon any Odd-Eyes from the hand, deck, or GY. Sky Iris can guarantee you a +1 if you have this, as you can get a search and a summon. From the GY means you can revive Vortex Dragon if it was summoned properly, meaning you get that bounce and negate effect again. You can also summon Persona Dragon from the deck with this guy to negate an Extra Deck monster effect. Unlike the Dark Magician and Cyber Dragon deck, the Odd-Eyes deck’s new card can open up some plays, which is why it is my favorite of the decks. An Odd-Eyes week to close out Legendary reviews before moving on to new sets and such. Odd-Eyes Arc Pendulum Dragon is a good card. Quite good. A Level 7, Dark, Dragon, on its own, all ready has tons of support. 2700 attack is good, and this card is also a Level 8 on the Pendulum scale. No Monster Effect, but the Pendulum side of this card is beautiful. You get to Special Summon an Odd Eye Monster from your Hand, Deck, OR Graveyard when one you control (note not even this card itself, but ANY) is destroyed. By Battle OR Effect, so this thing is a treasure trove just waiting to be opened, in addition to its strong attack. Honestly, as strong and powerful as it is on that side, it didn’t need a Monster effect too. It helps add some balance I feel. Starting off our final week of the legendary dragon decks, we have Odd-Eyes Arc Pendulum Dragon. Weighing in at 2700 attack and 2000 defence on a level 7 dark dragon, Arc Pendulum has above average stats for its level. Arc Pendulum has a respectable scale of 8, perfect for the Odd-Eyes archetype and hits the field as a normal monster. While its pendulum effect lets you summon an Odd-Eyes monster from almost anywhere if an Odd-Eyes you control is destroyed and I’d like to think that’s a pretty good effect. Sky Iris lets you destroy a card to search and in a full Odd-Eyes deck, Arc Pendulum will really shine.